Explore the personal and artistic life of Leonardo da Vinci, from his childhood to his apprenticeship with Verrocchio, from the establishment of his own workshop in Florence to his departure for Milan. 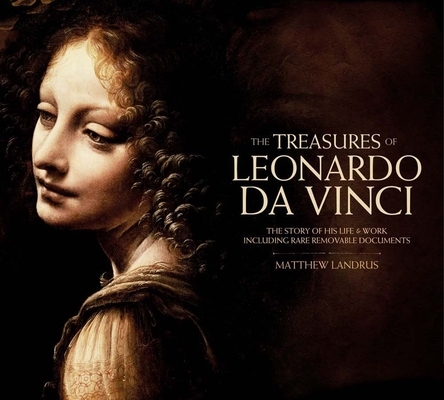 Packed with information about da Vinci's technique and style, this Treasures collection smoothly integrates information on Leonardo the man with examinations of his inventions and key paintings, including the "Mona Lisa" and "The Last Supper." Fifteen beautifully produced removable facsimile documents give unprecedented insight into Leonardo's world. Matthew Landrus is a specialist on the pre- and early modern visual culture of science, technology, and philosophy in Europe. He has published widely on the work of Leonardo da Vinci, with particular interest in the artist/engineer's working methods and preparations for books. An art and science historian, Dr. Landrus is a lecturer at the Rhode Island School of Design, a research fellow and tutor at the University of Oxford, and has taught at the Open University, University of Louisville, and the Savannah College of Art and Design.